UK “world music family restaurant” chain, Giraffe, recently invited Londonist over to sample the breakfast menu at their Marylebone location (6-8 Blandford Street, W1U 4AU). It's a pleasant place: nice lightning, comfy seats. We certainly wouldn’t be averse to going back (we’d downright welcome an opportunity if only they offered free WiFi). However, this was our first visit to a Giraffe. The faces-of-smiling-"ethnic-people"-as-wallpaper was a tad hokey for our sensibilities. Further, walled slogans such as "eat together, live forever" made us cringe a little. And (while we’re at it), we never really got Giraffe’s "global burgers" concept either. Is that just a high falutin’ name for a meatball or merely a reference to world beef consumption and its role in global warming? Whatever, we weren't there for the décor or the burgers. were utterly awesome. As for the huevos rancheros (£6.95), they were too deconstructed and prettified - inoffensive and ample but not terribly flavourful. While the eggs Benedict (£6.95) looked pretty rockin’, other nearby dishes, such as eggs on foccacia (£3.95), appeared mediocre at best. According to some gathered up promo materials, giraffes have the largest hearts of all animals. We reckon that has something to do with why this long-necked beast was chosen as the totem for this resto chain. We certainly got a sense that the staff at Blandfod Street were of the big hearted variety. Service was attentive and above average for Central London. 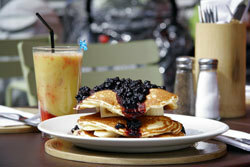 Brekkie at Giraffe? It’s a hit or miss affair with the hits adding up to a more than respectable net positive experience. Visit them online at www.giraffe.net.